When you present on postphenomenology, use the #postphenom hashtag so we can follow your work. Thanks! We are publishing a series of posts highlighting some of the tracks on the program of the 2016 4S conference, which will convene jointly with the European Association for the Study of Science and Technology (EASST) in Barcelona, August 31-September 3. The theme of this year’s 4S/EASST conference is “science and technology by other means.” – Ed. Barcelona marks the ninth year for postphenomenology research panels at 4S, this year meeting again with EASST. My presentation, “Science has always been technoscience” opens a panel by the same name and shows how archeoscience as far back as the Ice Age incorporates technologies. Pernith Leth-Espensen (Aarhus, DK) continues with an examination of innovative artistic uses of technologies in performance arts. Anette Forss (Karolinska Institut, SE) examines the empirical turn and how it can combine postphenomenology with ethnography. Bas de Boer (Twente, NL) examines the different ways technologies which examine the brain are non-neutral, while a closely matched paper by Jonne Hoek (Twente, NL) looks at how death is mediated in brain death, with its existential implications. Peter Paul Verbeek convenes a number of other such panels as well. Each of these papers relates technological mediation to human experience in the style which has become distinctive to postphenomenology. Posphenomenology panels have grown out of an STS-styled analysis which incubated primarily in the Technoscience Research Group at Stony Brook University, Peter Paul Verbeek’s graduate programs at Twente University in the Netherlands, and operations led by Finn Olesen and Cathrine Hasse at Aarhus and the DPU in Denmark. Today, some one hundred researchers have participated in a number of STS type conferences, of which 4S is the largest and most prominent. Currently, Lexington Books, a program of Roman Littlefield Publishers, carries a new series, “Postphenomenology and the Philosophy of Technology,” with a number of books already in print. Postphenomenology, like most STS approaches, often takes a specific technology and develops a ‘case study’ approach. There have been, to date, several themes which have all resulted in publications. These themes include imaging technologies in the sciences, medicine, and popular culture; information and communication technologies such as cell phones, the internet, media technologies; and many medical technologies, including hearing aids, cochlear implants, and limb prostheses. From these themes, various researchers have also become interested in posthumanism, transhumanism and enhanced experience technologies. In all cases human experience plays a focal role in relation to the different types of human-technology relations and mediations. Don Ihde (Stony Brook University, NY, USA) is the convener of track 131 and will also be responding to a discussion of his recent book, Acoustic Technics (Lexington, 2015), which deals with contemporary acoustic technologies, in track 153. Welcome to Postphenomenology.org. As momentum grows you will be able to read postphenomenological reflections, critiques, and other interesting “takes” on this movement here on our front page. So stay posted . . . pun intended. 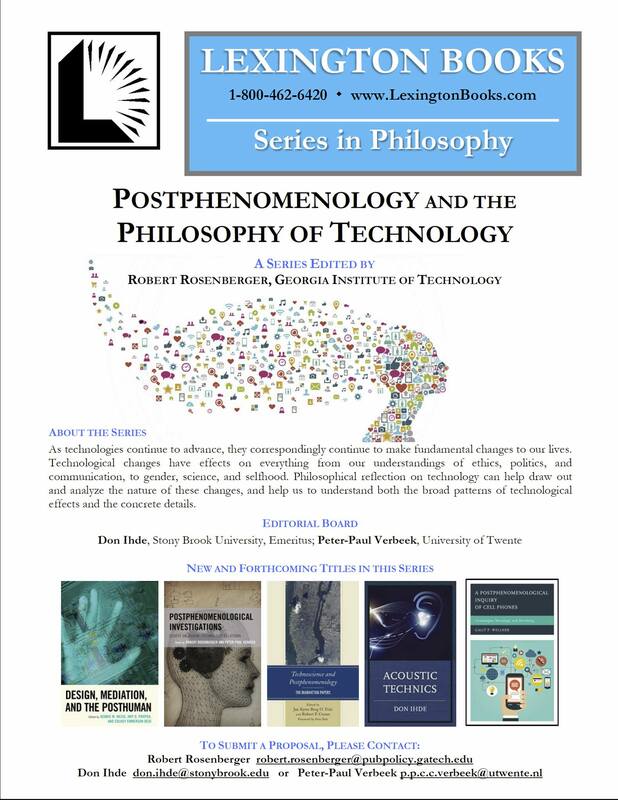 Please see our Book Series page for information about books published in our series: Postphenomenology and the Philosophy of Technology. We now have six books published and more in process.